The Acura RLX is a polite front-wheel-drive sedan with subtle luxury. It’s not flashy nor especially powerful for a class that includes the Lincoln MKS and Cadillac XTS. It’s handsome but understated outside, not slinky like the Audi A7 or Jaguar XF. It’s classy and understated inside. It’s well composed. There’s a smooth growl from its V6 engine, with acceleration from 310 horsepower that’s steady not neck-snapping, unlike the 429-horsepower Hyundai Genesis, another car in its class. For 2016, the RLX suspension has been retuned with softer shocks and springs, and 19-inch wheels are now standard. RLX was all-new for 2014, replacing the RL sedan. The 2016 Acura RLX leads its class in fuel mileage, with 20/31 mpg City/Highway and 24 mpg Combined. Safety is a focus, including a driver knee airbag and Lane Departure Warning and Forward Collision Warning systems, all standard equipment. RLX gets five stars from the federal government in every crash-test category, as well as Top Safety Pick in every category from the Insurance Institute for Highway Safety. The AcuraWatch system includes road-departure mitigation that uses steering correction when a camera detects wandering. This system can help drivers who aren’t paying attention, but found it annoying. This system will also steer the car at lower speeds behind another car, meaning stop-and-go traffic. But the calibrated following distance is so wide that other cars cut in front, and then it slams on the brakes. AcuraWatch is not standard, so you can avoid it or switch it off every time you start the car. The RLX Sport Hybrid model leaps fuel mileage to 28/32 mpg City/Highway, while being considerably more powerful and handling better, and equipped with all-wheel drive. RLX Sport Hybrid uses three electric motors and lithium iron batteries along with a 3.5-liter V6. The Acura RLX retails for a base price of $50,950 MSRP and comes fully equipped, including AcuraLink. For another $4000 there’s a Technology package, including fancier leather and the AcuraWatch safety suite including adaptive cruise control with low-speed follow, forward collision warning, collision mitigation braking, lane-keeping assist, lane-departure warning, a multi-view rear camera with dynamic guidelines, road-departure mitigation, and cross-traffic monitoring. The Advance Package ups the price another $5500 and adds all the fancy stuff including a 14-speaker Krell audio system with crystal clear sound. The Sport Hybrid price is announced but it’ll be well over $60k. 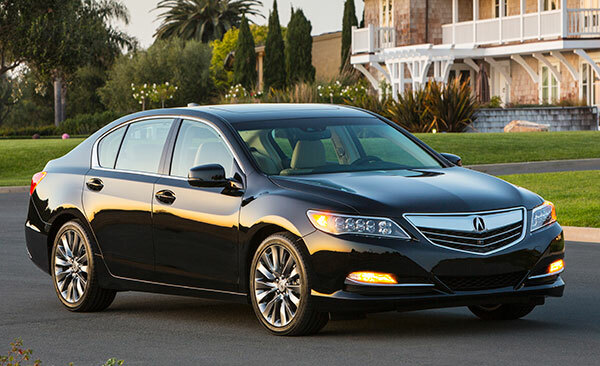 The RLX is subtle and graceful, with smooth and handsome lines that suggest muscle at the front fenders. It’s also nondescript and forgettable, a car that blends into the background. The only risk that Acura took with the styling is in the jeweled LED headlights, which don’t rescue the bland front end with an Acura boomerang of chrome on it. It doesn’t measure up to the individuality in the styling of the Jaguar and Cadillac it competes against. The interior is like the exterior, elegant but uninspired. The materials are point-perfect, but the design lacks the sense of drama that’s required in cars like this, never mind the multiple shimmering screens. Refinement is down pat but seems orchestrated. The cabin is nicely detailed, a functional place to perform the tasks of driving, although those multiple screens mean multiple guesses. The musical jingle that plays when the door is opened is a rare display of emotion from Acura. There’s good passenger room in rectangular spaces that read more like building architecture than car design. It’s not modern like an Audi or opulent like a Jaguar, it’s in between. The front seats have the best leather we’ve ever seen in an Acura, and fit like large executive desk chairs. Acura says the shoulder room is better than the German cars, without mentioning Cadillac, Lincoln or for that matter the Chrysler 300. Large rear door openings make it easy to slide in and out of the wide and long seats if you’re not tall; the sloped roofline makes tall folks duck, and rub their heads on the ceiling. There’s less shoulder room back there than we expect. The rear seats don’t recline like the big German sedans can do. There’s a lot of storage for small items. The center console is wide without taking up people space; its sliding lid opens from either side. The trunk is a different story; the floor is flat, and that’s good, but its 14.9 cubic feet is a couple gym bags smaller than the Lincoln MKS. The available Krell audio system takes up some more space, and the Sport Hybrid’s battery pack cuts the volume to 12.0 cubic feet. The front-wheel-drive RLX doesn’t use an electronic active suspension that’s common in the class, it sticks to your shock absorbers, links and springs. It’s a mildly cushy cruiser with only token amounts of feedback from the road. The retuned 2016 suspension includes upgraded dampers, softer springs and rear stabilizer bar, different rear bump stops, and 19-inch wheels. In the front, the shock mounts have been relocated. The goal was to lower the harshness, noise, and vibration, as well as softening the ride without compromising the handling. The RLX features a system called Precision All-Wheel Steer, or P-AWS. The rear wheels turn up to two degrees in the opposite direction of the front wheels, making cornering quicker and adding stability that’s felt mostly when changing lanes on the freeway. You can really feel it on a slalom course. The speed-sensitive electric power steering has a light touch around town. In the twisties the steering adds resistance, as the chassis leans into corners without drama. It handles rough roads with little fuss. The engine’s 310 horsepower and 272 pound-feet of torque are far from tops in the class, but the acceleration is still ample. The engine wakes up with some intake snarl when you floor it at 3000 rpm, with 0-60 times of six seconds about the same as the Lexus GS, which feels faster because of its peakier powerband. The RLX is steady. The six-speed automatic transmission has paddles and a sport mode. Downshifts are less invisible, while upshifts are very smooth. Other sedans in the class use eight-speed transmissions, for example the Chrysler 300. If you need higher performance, the Sport Hybrid SH-AWD model is your call, with 377 hp and 377 lb-ft of torque. In fact, a version of its special new three-motor hybrid system can be found in the future Acura NSX supercar. The basic 3.5-liter V6 is mated to a new seven-speed dual-clutch automated manual gearbox that has a 35-kW motor built in. Its all-wheel drive comes out of the two 27-kW motors in the rear differential. It’s a more exotic and exciting driving experience than you get in the front-wheel-drive RLX. It’s extremely responsive to the throttle. Add torque vectoring to the handling, and you’ve got something that can feel like it defies physics, by adding power at individual rear wheels to help steer the car. It’s the SH (Super Handling) part of the AWD. The RLX is competent but unexciting, inside and out. It’s not a car for extroverts. Its V6 engine offers the best fuel mileage in the class. The rear-wheel steering is a special feature that sets it apart from other front-wheel-drive sedans. The Sport Hybrid is the model that boasts performance.